Upcoming events will commemorate the third anniversary of the Emanuel AME Church shooting. 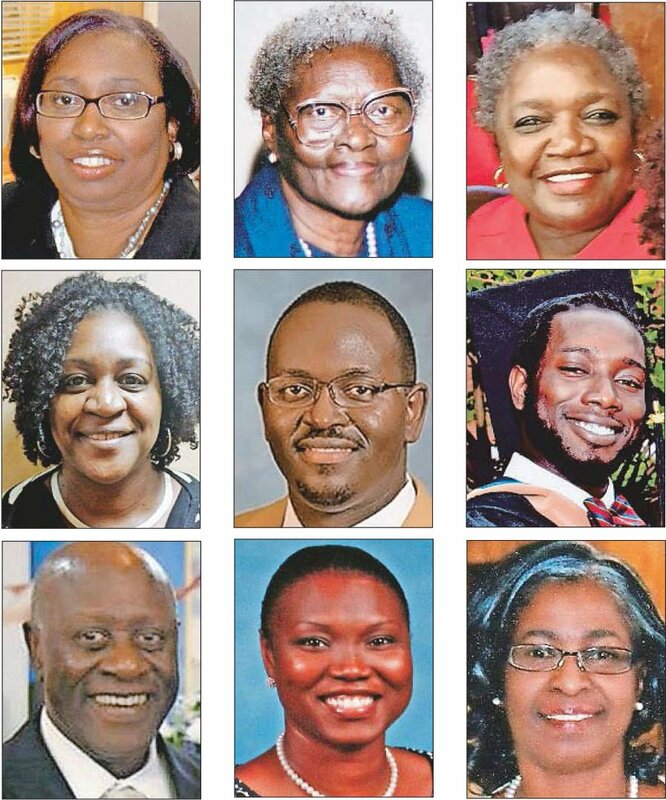 The nine victims are Cynthia Hurd, Susie Jackson, Ethel Lance, DePayne Middleton-Doctor, Clementa Pinckney, Tywanza Sanders, Daniel Simmons, Sharonda Coleman-Singleton and Myra Thompson. File photo. Librarian Cynthia Graham Hurd's long dedication to literacy and the public library system will be honored through several events this year. File photo. The public is invited to visit the library where Hurd once worked to write a note about gratitude. The first 100 children to participate will receive a free book provided by the Cynthia Graham Hurd Foundation. The Samaritan’s Feet Outreach Project and Emanuel AME Church will provide the ministry of “foot washing” and the distribution of 1,000 pairs of shoes to local children. View photos that document Hurd's 31-year career with Charleston County Public Library and her legacy beyond. Selected materials from Emanuel AME Church and other shooting victims also will be displayed. The public is invited to worship in remembrance of the nine shooting victims and survivors, featuring the Rev. Matthew L. Watley, executive pastor of Reid Temple AME Church in Maryland. To spread caring, come decorate kindness rocks to hide around town, write a kind note, donate non-perishable food for Lowcountry Food Bank, sign a reading pledge, and receive a free book provided by the Cynthia Graham Hurd Foundation while supplies last. Charleston County Library System will unveil a portrait of Hurd at this library branch, where she was director, at noon on June 20. Bible Study will be co-facilitated by Emanuel pastor the Rev. Eric Manning and the Rev. Anthony Thompson, husband of shooting victim Myra Thompson. Musicians from Seacoast Church will join this evening of worship, remembrance and Bible study. Emanuel AME Church, 110 Calhoun St. The Emanuel AME Church congregation and Palmetto Community Action Partnership invite all middle-school students to join a free day of interactive sessions that celebrate multiculturalism and diversity through collaborative art projects. Children will also gain tools to combat bullying and process tragedy. Based on a curriculum developed at Coastal Carolina University, children will learn how to appreciate diversity and differences and how to promote multiculturalism in their schools and communities. The College of Charleston's Office of Institutional Diversity and Inclusion and various artists from the community will help facilitate activities. Adults are invited to participate in educational sessions led by the MUSC Empowerment Center. Topics include how parents can help children cope with tragedy and how to properly respond to bullying. Supervision is provided by pre-screened volunteers and the Charleston Police Department. Volunteers are needed. To register or for more, call 843-730-3354, email choward@palmettocap.org or visit emanuelamechurch.org or palmettocap.org. The forum will engage a diverse audience in a candid conversation about race focusing on on racial disparities in education and economics. Speakers include CNN commentators Paris Dennard and Bakari Sellers; Lilyn Hester, Google's head of southeast public affairs; Elliot Smalley, superintendent of S.C. Public Charter School District; Michael Moore, president and CEO of the International African-American Museum; Alana Simmons, founder of Hate Won’t Win and granddaughter of shooting victim the Rev. Daniel Simmons Sr., and others. For more information and updates, please visit thecharlestonforum.com. The public is invited to this “Call to Action“ to end gun violence and seek racial reconciliation in celebration of the lives of the victims and survivors of the Emanuel AME Church shooting. Keynote speaker, the Rev. Dr. Jamal H. Bryant of Empowerment Temple AME Church in Baltimore, will join others including Charleston Mayor John Tecklenburg, Sen. Marlon Kimpson and activist Bree Newsome. Singer Joan Baez will perform. Other entertainment will be provided by violinist “Daniel D.”, Mr. Underrated, Lawrence Gordon Gospel, Benjamin Starr, The Dear Charleston Project. Register for the #Emanuel9RallyforUNITY at eventbrite.com. The theme of this year’s commemoration finale is “We Survive.” Performers will evoke the spirit of survival of a people. They include the Mother Emanuel Mass Choir, harpist Holly Avesian, Carl Bright & Family, June Dupree, liturgical dancer Stephen Polite, Mario Desaussure, Crystal Brown, Mike Brown & FOCUS.